Millions of buildings are constructed every year with large windows facing every direction. Up to 60% lighting, heating, & cooling energy could be saved by one simple, costless measure: face WINDOWS SOUTH, not east or west. 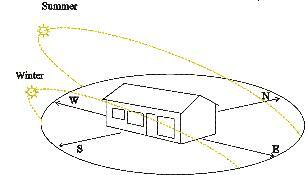 In summer, the sun rises in the northeast, sets in the northwest, so excess heat comes in west and east facing windows. The heat generated by one 6 ft by 6 ft window facing east or west is equal to burning one gallon of oil in the building each summer day. Little winter heat comes in east or west windows. In winter, when the sun appears low in the southern sky, welcome warmth enters the building through south facing windows. During the winter, west and east facing windows get only a few hours of sunlight while losing far more heat than they gain. WINDOWS SOUTH, BUT DON'T OVERSIZE ! NO,THE WINDOWS DON'T HAVE TO BE HUGE! Oversized windows are not necessary and may be undesirable. Excessively large, uncovered windows lose great amounts of heat at night and may allow excess heat to enter in the summer. Early passive solar buildings featured huge expanses of glass, which overheated the buildings in the daytime, and lost uncomfortable amounts of heat after dark. For achieving an ideal balance, contact the Passive Solar Industries Council. WINDOWS SOUTH, AND INSULATE !!!!! Don't let a builder convince you that less insulation is needed in a solar house. During winter the sun is not shining during the majority of the hours. Insulation keeps unwanted heat out in the summer. What they said wasn't cost-effective 5 years ago is a different story today. And are the savings in initial building materials worth the price of a war for oil, or polluted air? 36% of the nation's energy is used for building energy needs. If architects, engineers, and builders were to apply this one simple, costless principle... not only would huge amounts of energy be saved at peak-load hours, but building occupants would be much more comfortable. For detailed information, the book More Other Homes and Garbage by Stanford professors Gil Masters, et al., is available through your library or bookstore.